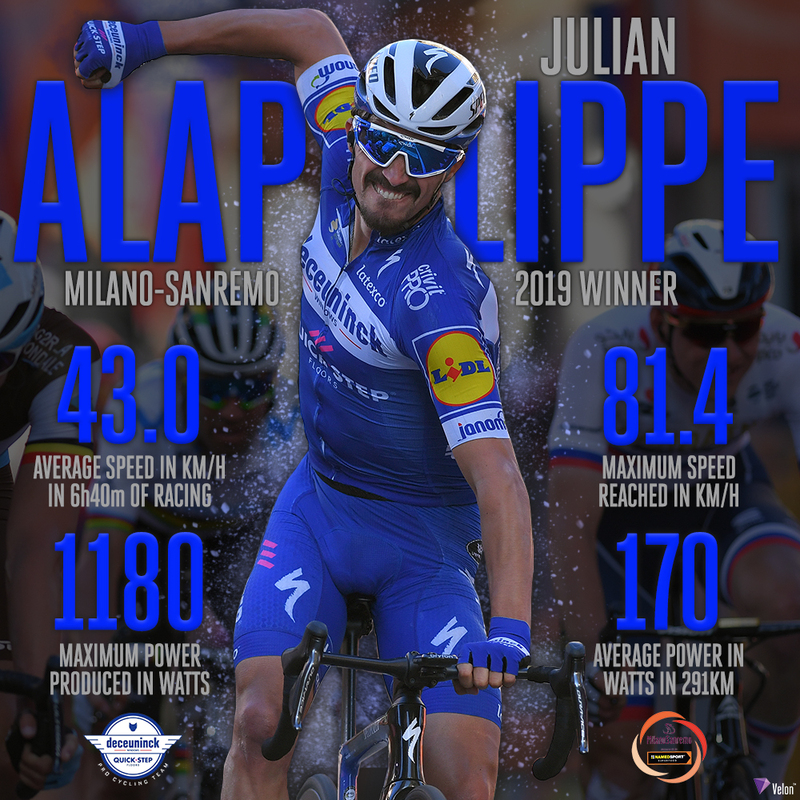 PezCycling News - What's Cool In Road Cycling : Milano-Sanremo’19: Allez Alaphilippe! 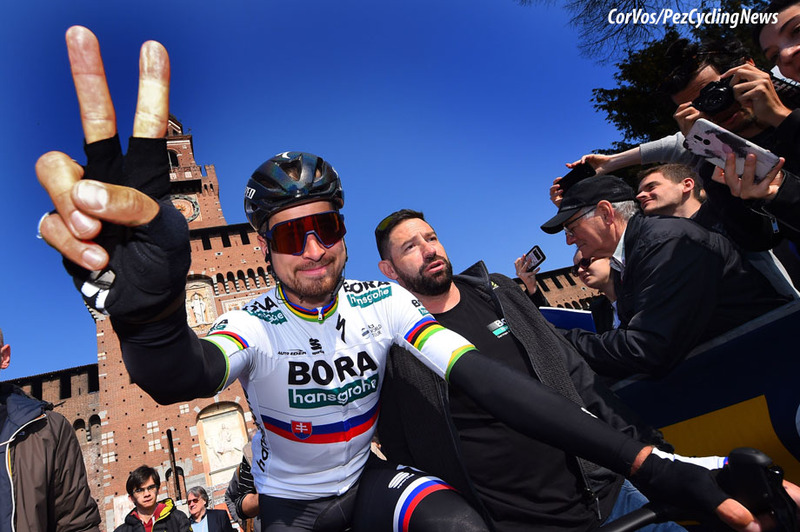 Race Report: The cream came to the top of the Milan-Sanremo peloton milk as the decisive group escaped on the final climb of the Poggio. 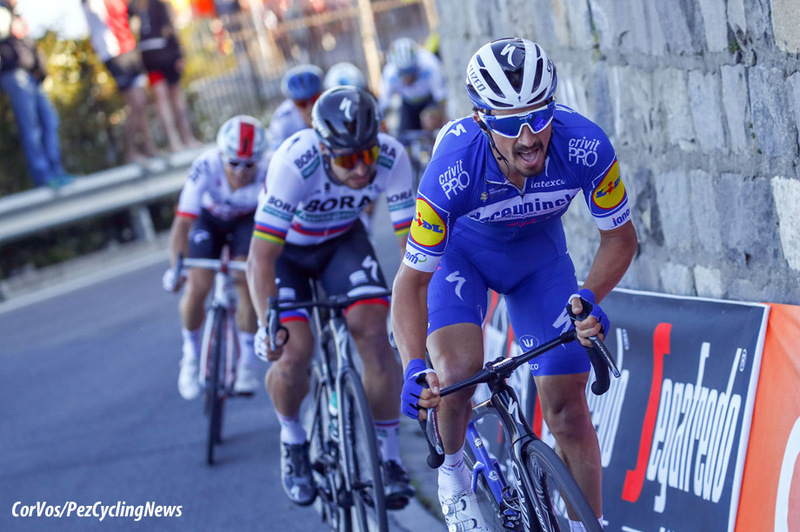 There were attacks aplenty on the run-in, but it was Deceuninck - Quick-Step's Julian Alaphilippe who crossed the line first on the Via Roma in Sanremo. 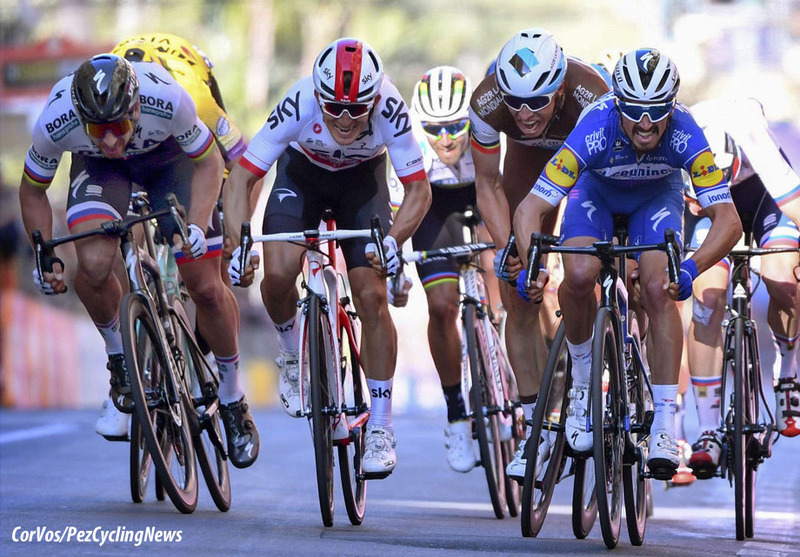 Julian Alaphilippe won Milan-Sanremo. 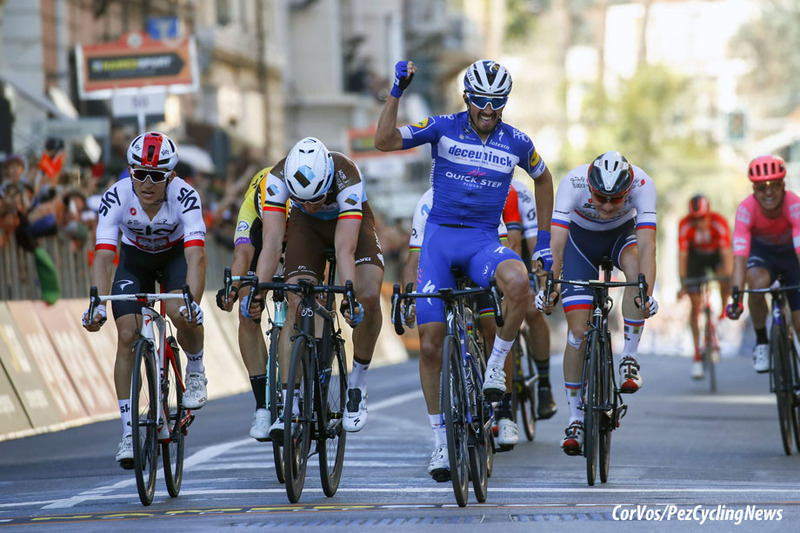 The Deceuninck - Quick-Step Frenchman took the Primavera, the best of a select group that forced its self away on the Poggio. Oliver Naesen (AG2R-La Mondiale) was second, Michal Kwiatkowski (Sky) third. 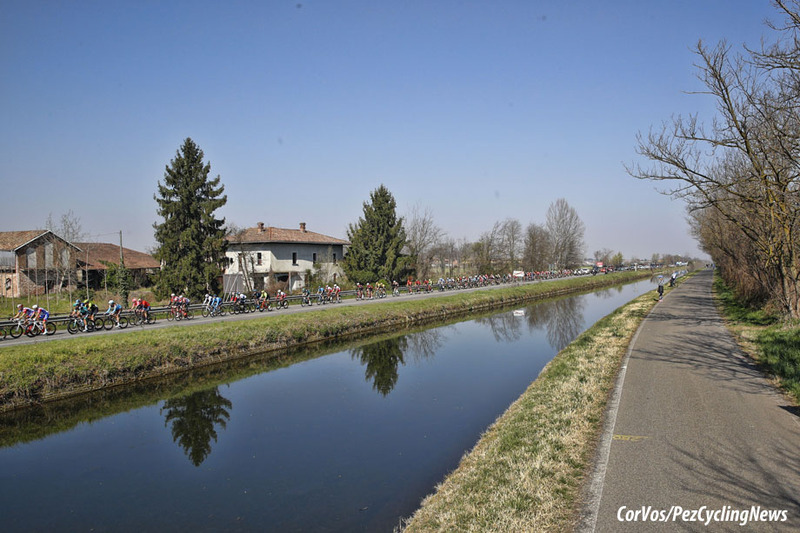 Data collected by Velon’s devices on the riders’ bikes tells the detailed story of La Primavera: Data can be found here. 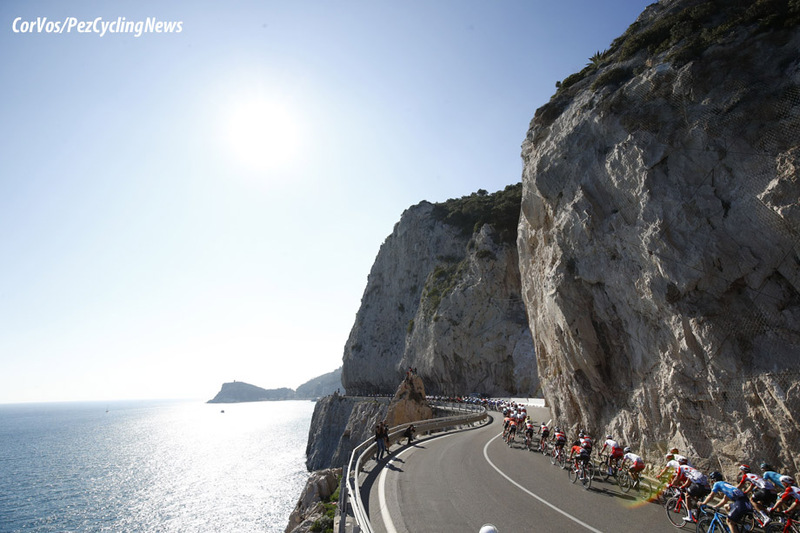 La Primavera once again lived up to its name with sunshine on the Ligurian coast for 291 kilometres between Milan-San Remo. The break of the day only took 10 minutes to make their bid for freedom. Four Team Novo Nordisk riders were among them: Joonas Hentala, Andrea Peron, Charles Planet and Umberto Poli, more than half of the Diabetes team were off the front of the race. 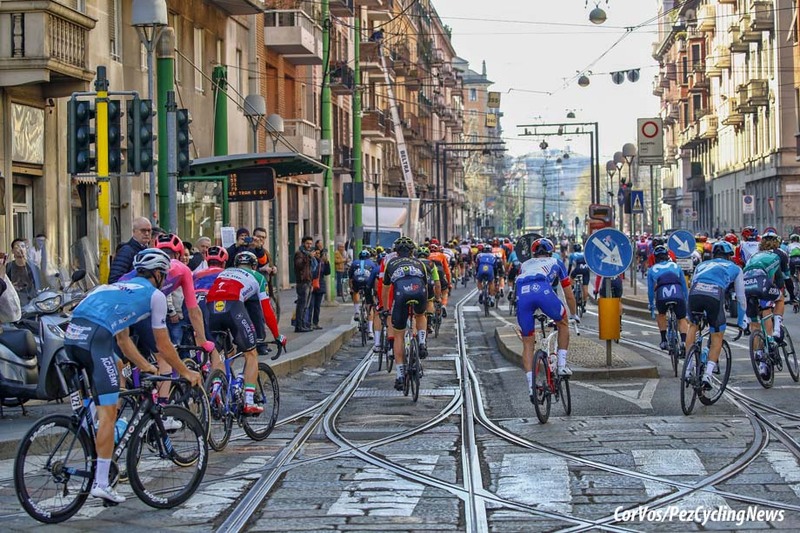 Guy Sagiv, Luca Raggio, Fausto Masnada, Sebastian Schönberger, Mirco Maestri and Alessandro Tonelli were the others who made up the front group. They built up a 10 minute lead, but this of course was not going to last. At first it was UAE Team Emirates who did most of the work to keep the lead under control. 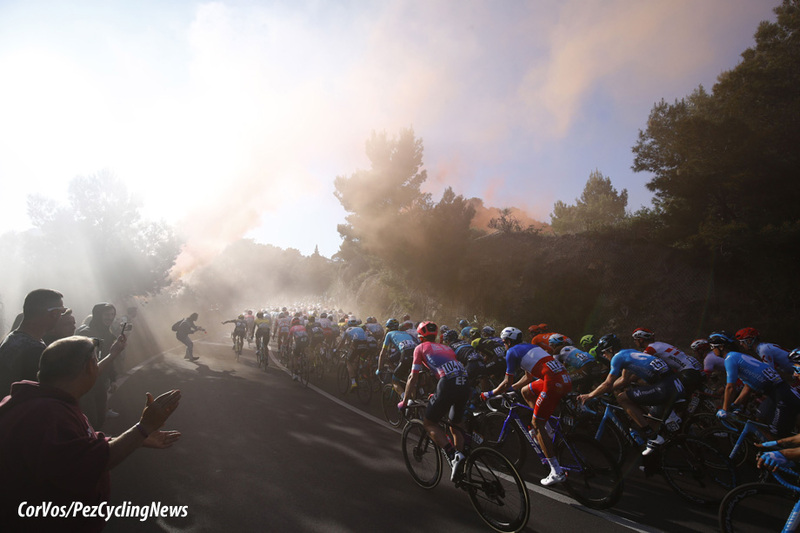 The gap to the peloton was soon reduced to 8 minutes and after the Passo del Turchino, at the halfway point, it was 5 minutes. 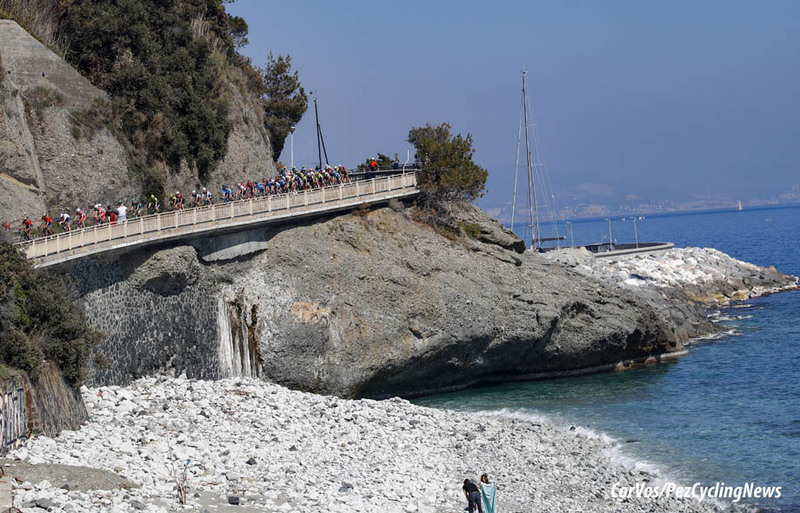 The Tre Capi (the Capo Mele, Capo Cervo and the Capo Berta) come 50 kilometres from the finish, but the peloton took the three climbs without any attacks. At this point the lead group fell apart and the peloton was only just over 1 minute behind them. Masnada went solo before the Cipressa, but the peloton increased the speed. 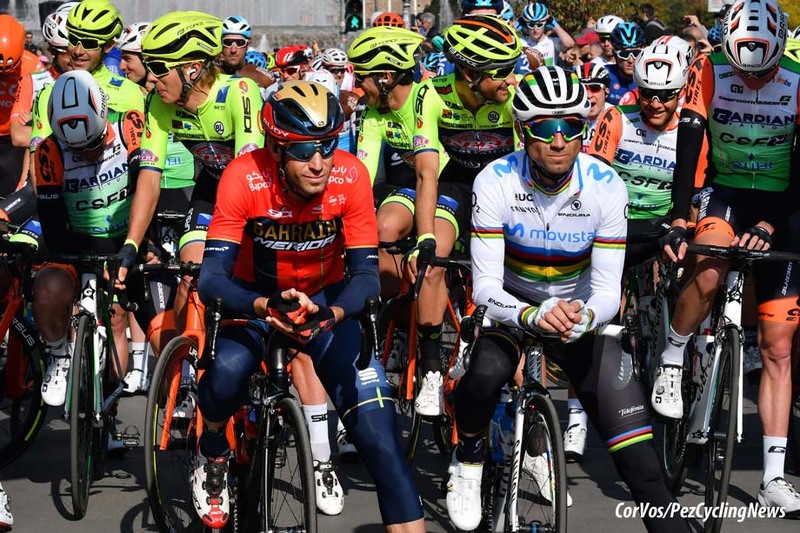 World champion, Alejandro Valverde (Movistar) and Peter Sagan (Bora-Hansgrohe) came to the front and the pace was so high that Masnada was caught before he hit the Cipressa. Once on the Cipressa, it was Astana that took the initiative. Laurens De Vreese set the pace at the head of the pack so that nobody could attack. At the back Dylan Groenewegen (Jumbo-Visma) was having problems in last place in the peloton hoping to survive the Cipressa. He was still there at the start of the Poggio. 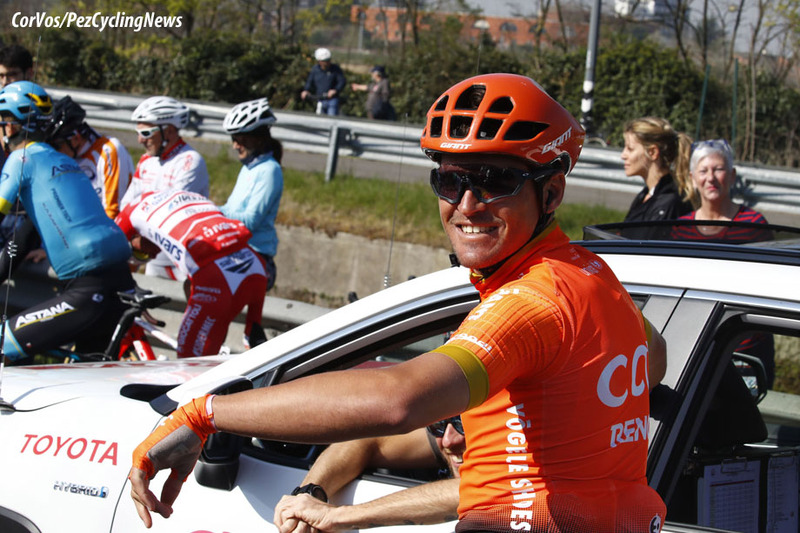 Niccolo Bonifazio (Direct Energie) attacked on the descent and took a 15-second lead, but it did not last long. 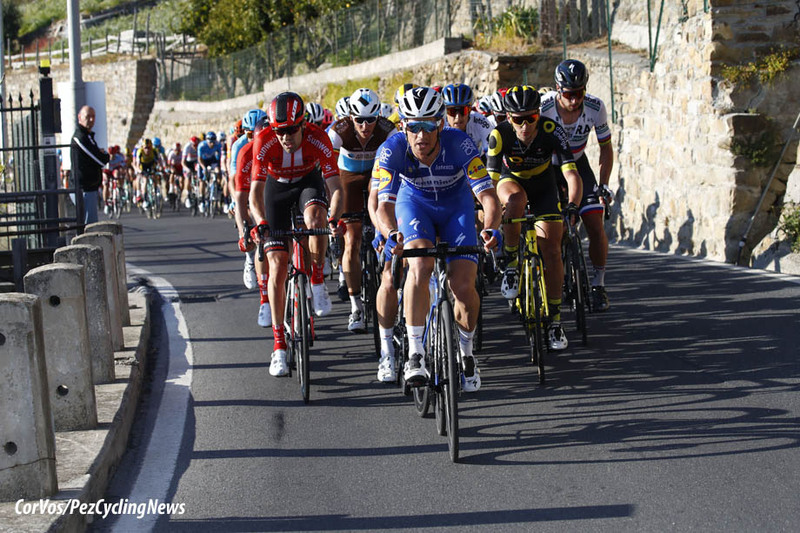 On the Poggio Deceuninck - Quick-Step set a blistering pace for Julian Alaphilippe as their fast-finisher, Elia Viviani, was slipping out the back. 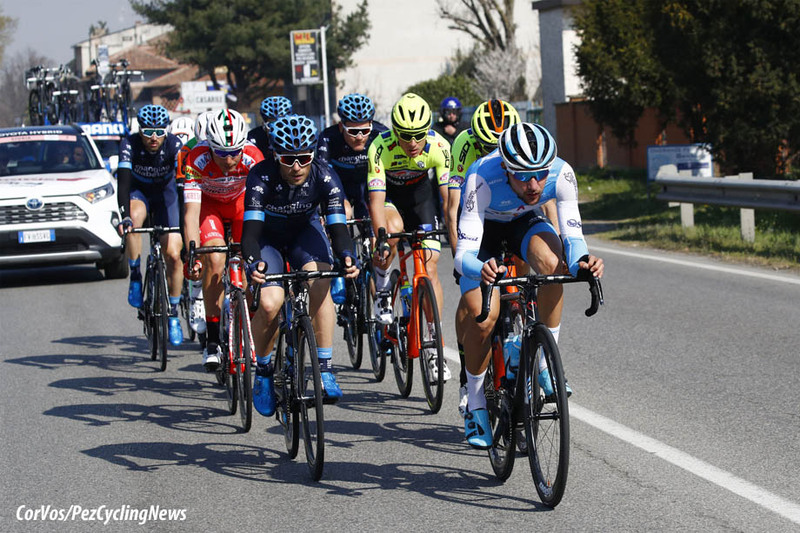 Alberto Bettiol (EF Education First) made the first move, he was immediately countered by Alaphilippe, Peter Sagan, Oliver Naesen, Alejandro Valverde, Michal Kwiatkowski and Wout van Aert. This was THE winning group, although Tom Dumoulin, Daniel Oss, Simon Clarke and Michael Matthews fought there way to the tail of the leaders. Into the last kilometre and it was the European champion Trentin who went for a long one, but it was the 'crossman Van Aert who had him back in the fold. 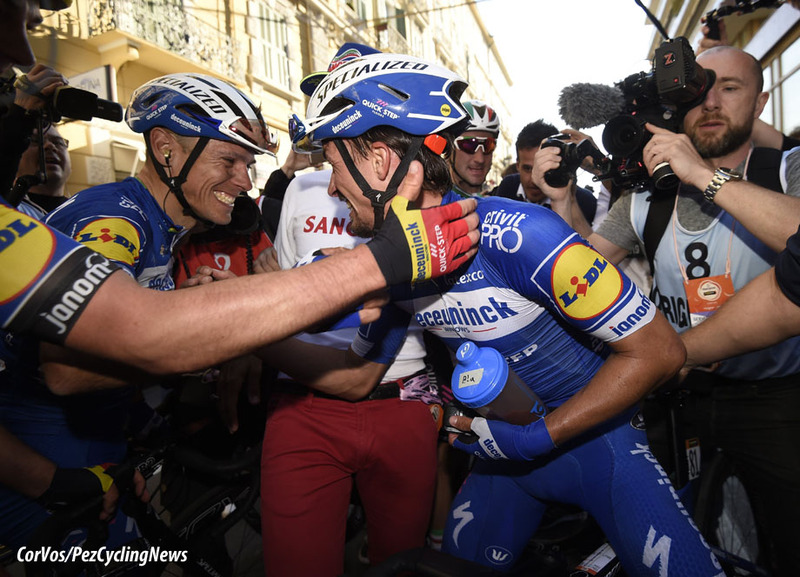 Matej Mohoric led onto the Via Roma, but it was Alaphilippe who was the strongest man in the race who hit the front and held the others off to take the big win. 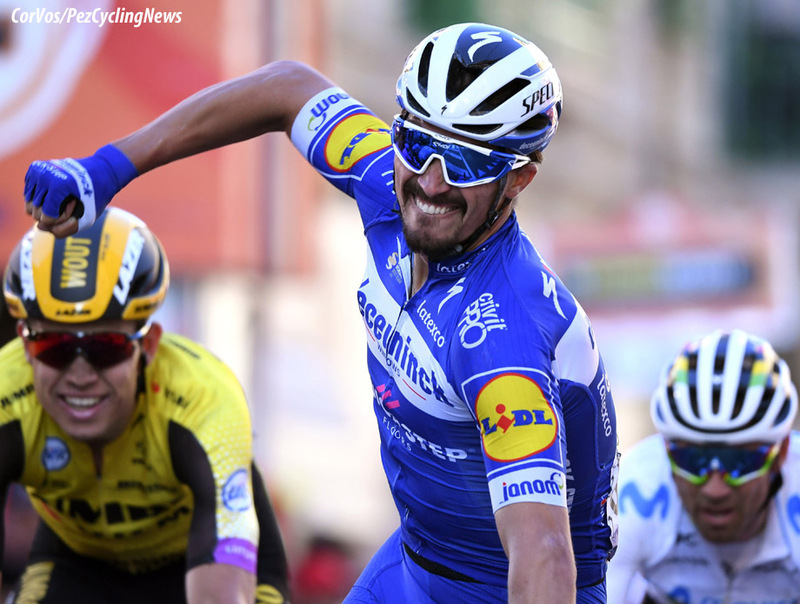 2019 Milano-Sanremo winner, Julian Alaphilippe (Deceuninck - Quick-Step): "I will need some time to realise what I have achieved today. We've made the race hard and I stayed focused. I followed Mohoric at 600 meters. I made no mistake. It's unbelievable!" 25. 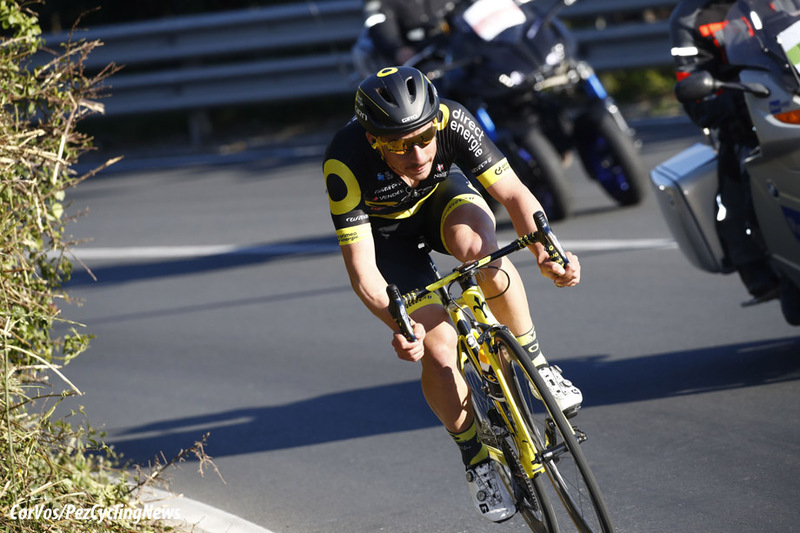 Luka Mezgec (Slo) Mitchelton-Scott.